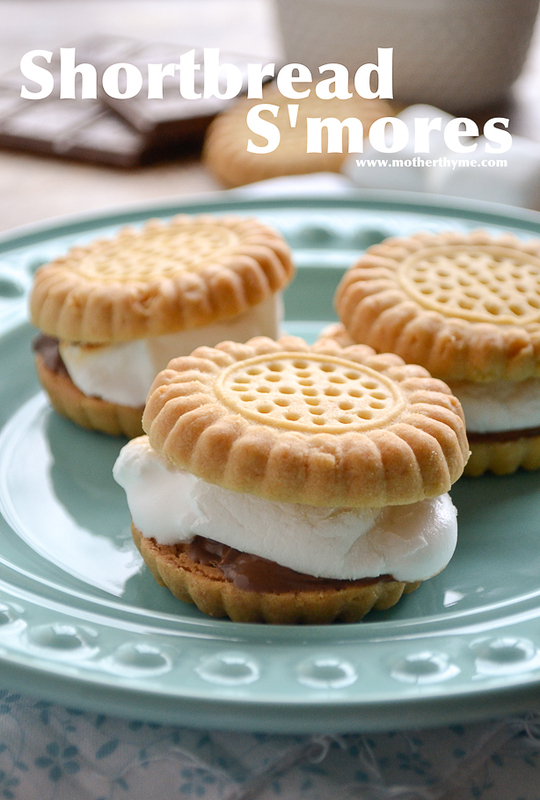 Enjoy these delicious Shortbread S’mores by the fire, or easily whip these up right in your own kitchen! 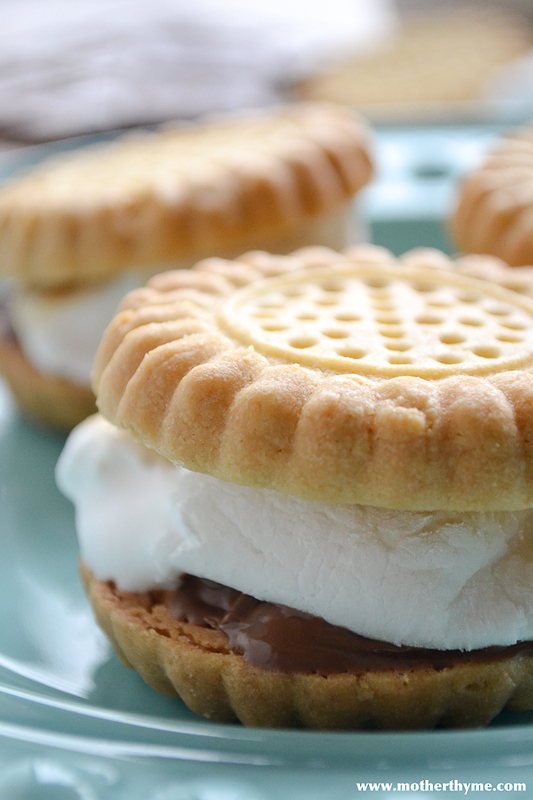 Who said you can only use graham crackers to making delicious s’mores? Walkers shortbread rounds are the perfect canvas to load up a piece of chocolate and a marshmallow to make one tasty s’more. If you live in the Northeast like I do, a little taste of summer is a welcome treat. Even if we can’t get outside to roast marshmallows, you can easily make these right in your own kitchen. You just need to pop them under your broiler for just a few minutes, and voila! You have an ooey, gooey toasted marshmallow. If you get a craving for one of these, Walkers has the perfect 2 pack of these delicious shortbread rounds, so you can make just 1, or however many you would like. The 2 pack shortbread are great for on the go. Tuck into your purse for a little snack with your afternoon tea, or to take on a weekend picnic in the park. I love having Walkers on hand. They are great for entertaining, especially for Spring brunches such as bridal showers, baby showers, Easter and Mother’s Day. Put these beautiful Walkers shortbread on a tray and dessert is served. You can even get a creative and serve these with some toppings on the side like melted chocolate, hazelnut spread and jams and lemon curd or have fun with your guests and make these yummy and easy Shortbread S’mores. Don’t miss these other easy Walker recipes! Walkers is offering Mother Thyme readers 20% your entire order (excluding sale items) from 3/20-3/27 2014. Use promo code MTSPRING2014 at checkout. Click HERE to order a few boxes of these delicious cookies and have them delivered directly to your doorstep! For the latest updates, follow Walkers and Mother Thyme on Facebook! Put a piece of chocolate on top of one shortbread and top with marshmallow. Place on baking sheet. Place baking sheet under broiler for 2-3 minutes, watching carefully until marshmallow is toasted. Spread strawberry jam or your favorite jam on shortbread before placing on top of marshmallow. If using hazelnut spread instead of chocolate, spread on shortbread not going in oven. Place marshmallow on 1 shortbread and toast. 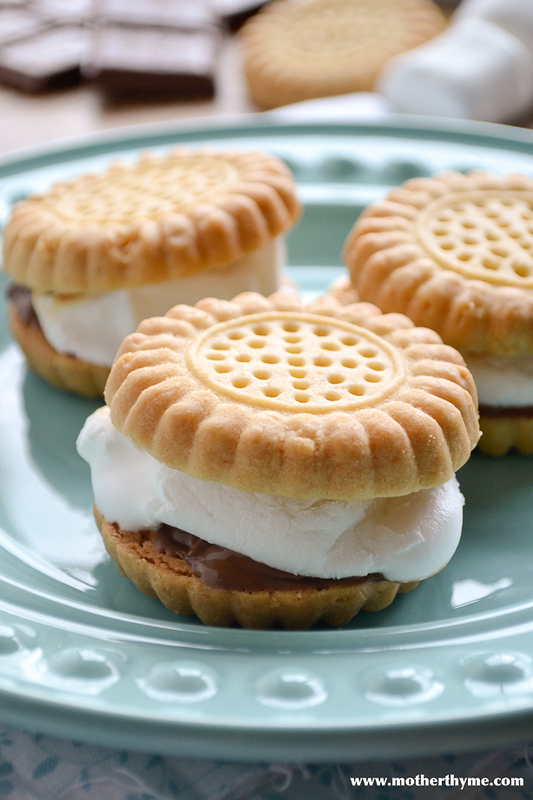 Spread hazelnut spread on second shortbread and press down on toasted marshmallow. Disclosure — I have a partnership with Walkers Shortbread. I received product to review but was not compensated for this post. All opinions are my own. Such a great idea!! Shortbread + chocolate is amazing, and with marshmallows? Even better! I can hardly stand how delicious these look, and your photos are awesome!